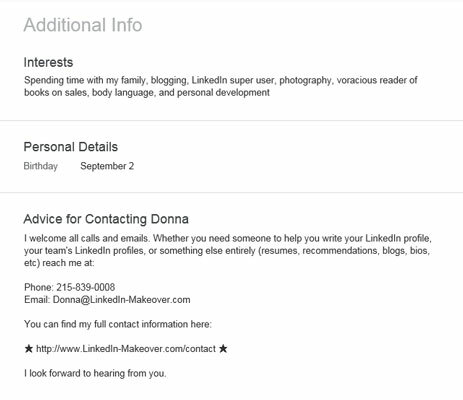 Within the Additional Information section of your LinkedIn profile is Advice for Contacting. This is a fantastic field that few people ever fill out. This area doesn’t show up on your public profile, but it is visible to your LinkedIn network. Just as the name implies, this is where you tell your audience why and how to contact you directly. Success on LinkedIn is getting off of LinkedIn. It’s in the real world where strong relationships are forged. The Advice for Contacting section helps your reader get off of LinkedIn and start down the path toward real-world communication with you. When you let people know why and how to contact you, you open the door for opportunity. Not everyone prefers the phone. Do you pay more attention to text messages? Do you rarely check voicemail but always check email? Is Skype your communication mode of choice? This is information to share with your readers so they know the most successful way to reach you. The best way to reach me is via Skype. My username is donna.serdula. If email is better for you, my address is donna@linkedin-makeover.com. Click the Additional Information section that appears toward the top of your profile to add the Advice for Contacting section to your profile page. Scroll to the Advice for Contacting section, hover your mouse pointer below Advice for Contacting, and click the pencil (edit) icon to enter into edit mode. Click your mouse inside the text field and start typing your advice to your readers. Let folks know how best to contact you. The Advice for Contacting section is visible to your full LinkedIn network. This provides the possibility that your phone number or email address might be used for marketing or nefarious purposes. However, there is an even better chance that your contact information will be used to benefit you. Recruiters, reporters, event planners, hiring managers, angel investors, long-lost colleagues, donors, and others will use it to reach you.